GAZPACHO – Chilled Soup For A Hot Day! Summer’s here and sometimes I just don’t feel like cooking….but I want a homemade meal. Gazpacho is the answer! It takes only a few minutes to prepare, NO COOKING, extremely low in calories, and it uses ingredients that are fresh from the garden (or farmer’s market). This soup is best served icy cold, so I like to make it the day before. I’ve included a recipe for garlic croutons for you adventurous souls up for a wee bit of cooking, but you can always purchase them, if you like. Into a large glass or ceramic bowl combine the vinegar, salt, and black pepper. Slice tomatoes in half around the equator. Remove pulp and seeds by poking them out with your finger. Chop pulp and flesh into bite-sized pieces. Place all of the tomatoes into the bowl (including seeds). Cut off and discard stem, seeds, and filaments of red pepper. Chop pepper into bite-sized pieces and add to bowl. Cut cucumber in half. Remove skin from one half. Slice both pieces lengthwise in half. Scoop out and discard seeds by scraping them with a spoon. Cut cucumber into bite-sized pieces and add to bowl. Add pressed garlic and diced onion into the bowl. Stir all together and let set 5 minutes. Stir in tomato juice and Tabasco. Cover and chill at least 8 hours. In a small bowl combine olive oil, garlic, and salt. Let set 20 minutes. Strain into mixing bowl, discarding garlic. Add in the bread cubes and stir to coat cubes. Pour onto a jellyroll pan, spreading them out. Bake until lightly browned – about 15 minutes, stirring now and then. BORSCHT – Pretty In Pink! With the weather heating up and bulky clothes coming off, I’m always looking for ways to appease my hunger but shred the pounds. Soups are generally my go-to diet food since they fill you up without a lot of calories. But hot soup in hot weather doesn’t really appeal to me, so I look to chilled soups. For some reason I’ve always been leery of beets. It’s not that I didn’t like them – I’d never even eaten one. When they came in a salad, I let these deep red strips remain untouched…until my husband inevitably asked if he could have them. I’ve been hearing about how nutritious beets are so I finally decided it was time to face my fear and actually try them. Since my husband mentioned recently that he loved borscht (beet soup), I figured I’d start there. Not only was the soup super easy, but superb (I’m in an alliterative mood). Note: Beets stain, so take care handling them. I got a drop on some fabric, but used OxyClean immediately and it came right out. Scrub beets clean and leave unpeeled. Into a saucepan place the whole beets, 4 2/3 cups water, onion, sugar, vinegar, and salt. Bring to boil, cover, lower flame, and let simmer until beets are easily pierced with a skewer (about 45 minutes). Remove beets to a cutting board to cool enough to handle. Line a strainer with a paper towel and place over a bowl. Remove and discard onion from saucepan, then carefully (so you don’t splatter) pour liquid into strainer (DON’T FORGET THE BOWL UNDERNEATH TO CATCH THE LIQUID!). Set bowl aside. Using the wet paper towel, rub the beets to remove skin. Remove and discard the top and bottom of beet. Take half the beets and shred them (a food processor makes quick and clean work of this). Place in a small bowl and refrigerate at least 2 hours. Take the remainder of the beets and cut into 1/2″ chunks (exact size doesn’t matter). Place in a blender and top with some of the saved beet liquid so that they’re submerged about 1″. Blend until pureed – at least 1 minute. Add in remainder of the liquid and refrigerate at least 2 hours. GOLDEN GAZPACHO – Soup With The Midas Touch! In my part of the world, summers are brutal. It’s not unusual for temperatures to rise above 100º F (for you celsius folks, that’s over 38º)! So, what am I making for dinner? Soup! 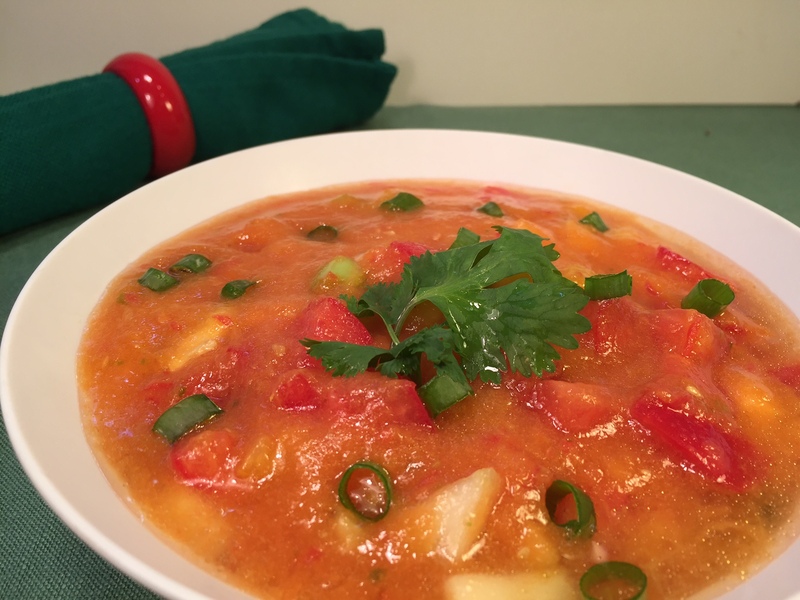 No, the heat hasn’t addled my brain – I’m talking chilled soup, specifically GOLDEN GAZPACHO. The key is to make it early in the day. This serves two functions: 1) the kitchen hasn’t heated up yet so I can comfortably do my chopping, and 2) for Golden Gazpacho to be at its peak of flavor, it needs to be ice cold. There’s a lot of wiggle room in this recipe. You can adapt it to suit you preferences. In fact, I once mistakenly bought a papaya instead of the called-for mango. (As I sliced through it, I kept waiting for the giant seed – it never came.) Papaya was wonderful, and a lot easier to cut up. NOTE: Cilantro is one of the ingredients. A lot of people (including myself) think it tastes like soap. So before adding it to your whole batch, do a taste test with a small portion. I have to divide the soup and add cilantro to half since my husband prefers it, and I hate it. But – I love my husband. In a blender or food processor, purée 1 tomato, vegetable stock, chili, lime juice, turmeric, salt, orange juice, 1/3 cup mango, and 1/3 cup cantaloupe. Pour into large serving bowl and add remaining ingredients. Season to taste with salt and pepper, if desired. Refrigerate at least 4 hours – the longer, the better.